Pink slips have been sent out to 13 Ann Arbor firefighters who will lose their jobs effective Jan. 4, City Administrator Roger Fraser said today. Another vacant firefighter position will go unfilled in an effort to save about $400,000 between now and June by having 14 fewer on the payroll. Fraser said it wasn't an easy choice, but it was one that had to be made. City Administrator Roger Fraser discussed the city's growing budget problems at a retreat this past Saturday with the City Council. Fourteen positions from the fire department are being cut from the budget and more cuts are on the way. "The whole business of having to make reductions in the organization is as uncomfortable as can be," he said. "And any time it impacts anybody, it makes you lose sleep at night - I don't know how else to say it." More than $3 million in mid-year cuts are being implemented by Fraser. The city also will save $811,475 by not filling several vacancies in the police department. When the city offered buyouts to officers this year, it expected 18 to go, but 24 took the offer. Cuts to public safety may not stop there. Fraser announced today he has directed the police department to come up with options for trimming an additional $2 million from its budget by the next fiscal year beginning in July. The fire department also must come up with a plan for trimming another $1 million. For the 2011-12 fiscal year, Fraser said both departments are being asked to dig further and cut the same amounts from their budgets. "By the time you add all that up, you're talking about some significant reductions," Fraser said. He noted the city has been working toward increasing efficiencies for the last seven years, and now mostly jobs and important services are on the chopping block. Public safety currently represents about 48 percent of the city's $83.2 million general fund budget. Fraser said cuts to the police and fire departments aren't ideal, but in the absence of additional revenue, they're unavoidable. The city must trim its budget by 30 percent over three years to address falling property tax revenues and declines in state revenue sharing. Mayor John Hieftje agreed it may be hard to avoid more cuts to public safety in the months ahead. "As we look at the budget, it's pretty much near impossible to make cuts without affecting safety services that are half of the budget," he said. "You can't take 30 percent out of half of your budget." Police Chief Barnett Jones, the city's safety services administrator, said it'll be tough to avoid jeopardizing safety services with cuts that deep. "Realistically, that'll be impossible because that's just bodies," he said. "There's nothing else left to cut. There's no fat in either of those departments and it's just service people and programs, so I'm going to go through the exercise of creating the reduction match and hopefully I don't have to go through with that." Jones said he'll be working on the police department's plan for proposed cuts. The city is in the process of considering five candidates for the vacant fire chief position to replace former Chief Samuel Hopkins, who retired in September. Jones said the new chief would start in January and work on the fire department's reduction plan for the coming fiscal year. Matt Schroeder, left, president of the city firefighters union, and Shane Doyon, one of 14 firefighters on the chopping block, listen to Roger Fraser talk about the need to trim the city's budget at the Saturday retreat. "I'm hoping that we don't wind up with any more cuts in either service, but I understand that Ann Arbor is like every other city in this state right now and there's revenue problems," Jones said. "I'll be trying to come up with any idea I can come up with to avoid this ... because we're as thin and lean as we can get, and any further reductions on either side might become a safety concern for all of us." Fraser said he plans to hold a special working session sometime in January with the City Council to further discuss the city's budget problems. He said an executive report based on discussions at Saturday's budget retreat should be finished sometime next week and will detail the options on the table. 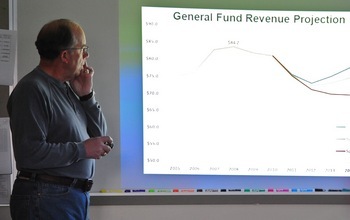 City officials have been mainly discussing ways to cut expenses in light of falling revenues, but not much talk has centered on increasing revenues. Fraser acknowledges some hesitancy about asking voters to approve more taxes, but says a city income tax and a Headlee Amendment override are still on the table. The city's projections show a city income tax - at the bare minimum - could increase city revenues by $7.6 million or more, even after factoring in a decrease in property taxes that would go in tandem with the tax. City officials say that would increase revenues while shifting some of the city's tax burden off of residents onto people who commute to Ann Arbor for work. The Headlee override is another option that might be less cumbersome for the city but would mean a tax hike for residents. The city's charter gives the City Council authority to levy up to 7.5 mills for operations, but a combination of two state laws - Headlee and Proposal A - effectively reduces that cap each year. A Headlee override, if approved by voters, would suspend state law and reset the bar to 7.5 mills. That could raise $6.5 million or more in new revenues. Fraser said Ann Arbor residents need to take a close look at what's happening to city services and decide what they value and how much they're willing to pay. "Citizens are not willing to pay more taxes unless they're feeling some discomfort over the way things are," he said. City officials continue to work toward pay cuts and reductions in spending for employee benefits. The mayor proposed a 3 percent pay cut for all city employees that is being taken to the table in negotiations with the city's unions. Fraser, who has not seen an increase in his salary since 2005, said even he and his administrators aren't exempt from pay cut considerations. "I'm not personally anxious to do that, but if that's what we have to do, that's what we have to do," he said. "There are none of us that are exempt." Fraser indicated at last Saturday's city budget retreat that the city is working to modify the costs of employee health care. An analysis of city employee compensation shows, for example, that the average firefighter in Ann Arbor receives more than $100,000 a year in pay and benefits. As one example, a firefighter making $63,624 this year in salary also is provided $42,468 worth of benefits and other compensation. "We believe there are some things we need to do to fine-tune our costs on our benefit programs," Fraser said. "We recognize that, to a degree, we are above the market in terms of the benefits that we pay and the cost of those benefits, but I doubt it's as extreme as some folks in the community suggest. We're not that far out of whack."